Zion is one of my favourite places. It's not just the sheer immensity of the landscape, nor the vibrant colours of the rocks. It's not the silence of the winter air, or the contrast between the permanent cliffs and the temporary snow. It's the combination, the poetry of the contrasts of light and shade, of rock and water, of the millions of years that have gone to make this instant. 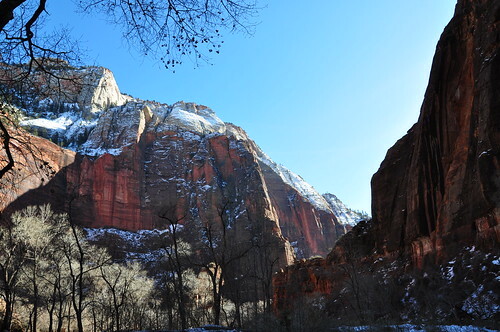 Deep in the canyon, on the river hike to the Narrows, you can turn around and look down the twisting and turning walls, to Angel's Landing and the surrounding peaks. It's a wonderful view, up there with the classic Yosemite panoramas. Have you hiked along that ghastly trail with sheer cliff drops on either side of a chain? There isn't enough money in the world that could get me to do that.